The line between a dress shirt and a casual shirt is not as clear as it used to be. Patterns that used to be reserved for a casual look (checks and plaids) are now appropriately being worn with suits and sportcoats. The fabric and collar style have more to do with the difference between formal and casual. Our choice for fabric is a broadcloth weave for the most formal and a pinpoint oxford for slightly casual. The semi-spread collar will be appropriate for any occasion. The degree of spread should measure about 3.5” from tip to tip and for most men 2.75” in length is perfect. If the points of the collar do not sit slightly under the coat lapels, the degree of spread is too close. Ready made dress shirts in neck and sleeve size fit fewer men properly than any other category of ready made clothing. A proper fit (starting at the top) is a collar that sits slightly below the Adam’s apple and is large enough to allow a finger to slide between neck and inside collar when fully buttoned. Most incorrect fits we see in our travels are far too big. So as trim as possible, but still comfortable. The tolerance of a shirt is how much bigger the chest and waist of the shirt are than your chest and waist. Five to six inches bigger works well today for a trim look that is comfortable. A shirt that is too big looks sloppy and does work for any body type. If your ready made size is too big in the chest and waist, try a trim fit. The sleeves should be long enough to allow the cuff to show ¼” to ½” beyond the coat sleeve. Usually 1.5” beyond the writs bone works. If neither regular or trim fit works, go to the custom option. You should not have to pay much more than ready made because of the efficiencies in manufacturing today, and delivery is no more than three weeks. All cotton is best for comfort, appearance, and durability. We have tried “Easy Care” blends and they just don’t look or feel as good as a premium cotton fabric. 3. Navy check or stripe on white. 4. Pewter gray check or stripe on white. 5. Dark red check or stripe on white. 6. A stripe is perceived as more formal by most. 1. Versatility. 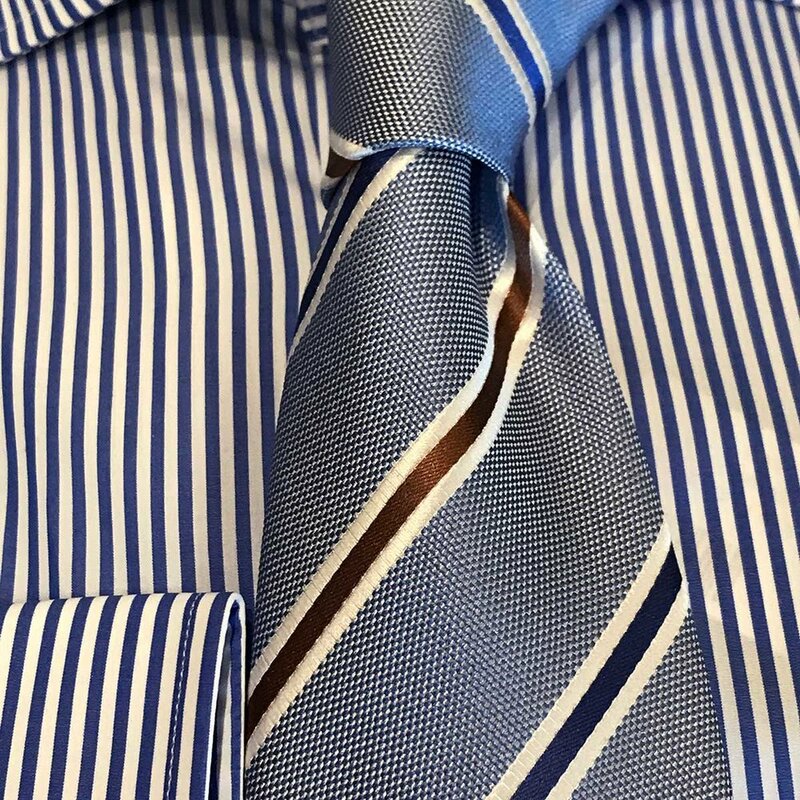 A shirt that pairs with more than one pattern suit and more than one pattern tie is better. 2. Make sure the fit is comfortable AND stylish. With shirts, the custom option should be given strong consideration. 3. Buy fewer but buy better. 4. Take your time in building your shirt wardrobe. Develop and refine your style as you go along.